London Fashion Week wrapped up Tuesday in England: check out the big-name designers and models in attendance, plus some of our favorite looks. Nicole Scherzinger and Alan Carr were among the celebrities on the front row at Julien Macdonald's London Fashion Week show, with models including Winnie Harlow strutting their stuff on the runway. PARIS - Heavy-metal-inspired looks were done in vegan leather: transitioning to cruelty free fabrics is the brand’s current focus. 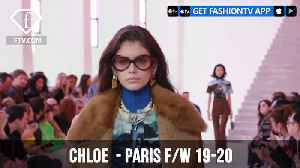 “The collection was inspired by heavy metal and the..
MILAN - It’s nearly impossible to view the latest presentation from Gucci without acknowledging the all-encompassing backlash from the past weeks, though Fall/Winter 2019 was surely designed by..
ISTANBUL - FashionTV presents EzraTuba direct from Mercedes Benz Fashion Week Istanbul on March 21st with Stratejist, Estetik International, and OnH fashion and more. Who's ready for some high.. The Delhi Times Fashion Week is all geared up to amaze Delhities by bringing the best in the lifestyle space under one roof. The event is scheduled on 5th, 6th & 7th April at Aerocity. The first day..
LOS ANGELES - Another LA Fashion Week has wrapped. Watch out for some of the amazing designers who showcased at Los Angeles Fashion Week Powered by Art Hearts Fashion this season. 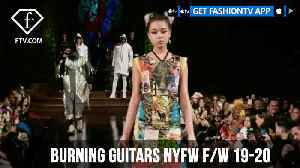 For more FashionTV..
NEW YORK - While model and rapper Smiley Jonez hyped up the crowd with his Afro-Caribbean sound, European clothing company Burning Guitars took the stage. Dresses incorporated asymmetrical hemlines,..
TEL AVIV - Bananhot Swimwear makes a huge splash at Tel Aviv Fashion Week 2019 by Models Neta Alchimister and Noa Beny. Produced by Israeli Fashion Mogul Motti Reif. This year, they continue to promote..